Over the past calendar week, slaughter belts were running at full capacity within European slaughter companies in order to manage the backlog of supplies which had piled up over the turn of the year. There was already some indication of the market clearing and balancing in Germany by the middle of last week. 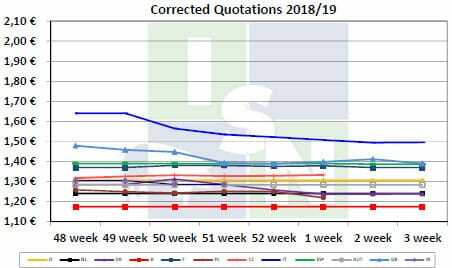 Therefore, the German quotation remained stable for as long as 13 weeks and and has now dipped slightly (a corrected €1.31 per kg slaughter weight). In view of the balanced situation in Germany, slaughter pig prices in other EU member countries have followed suit. Sale of backlog supplies is reportedly still continuing in the live animal market. In Austria, massive snowfall has hampered fresh-meat deliveries to winter sports resorts, according to the Austrian VLV. Spain continues rank on top within the the European price structure among the five EU member countries most prominent in pig keeping. France remains second, followed by Germany in third place, while Denmark is bearing the red light, ranking right behind the Netherlands. In the UK, the quotation has only gone down slightly. The local slaughter pig market is starting into the new calendar week in a balanced way. There is no pressure from the quantities of live-animals on offer. Tradespeople are sporadically already looking for additional lots.